Use this feature to import multiple files at a time, from your web server, or you can import files from a CSV file. You can set Categories, set visitor access, change the title for each file, add a description for each file and also can set passwords for each file. Step 1: Select a directory from Dir Tree, where you uploaded your files using FTP. Step 2: Click “Set as Import Dir” to load files associated with the selected directory. Files will be listed on the right side section. Step 3: check the checkbox at the first column of each row you want to import. You can change the title of the file, add a description and set passwords for each file. 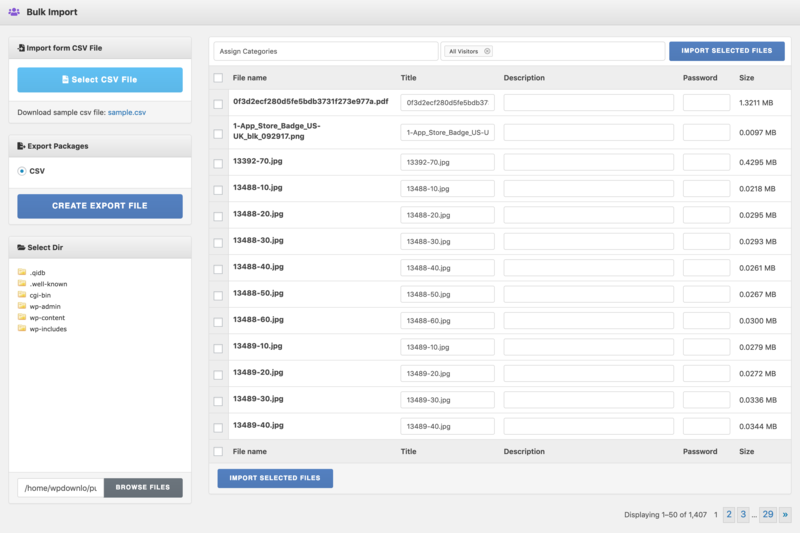 Step 4: You can assign categories to your files. Select categories from the category list. Note that, selected categories will be added to all files you selected to import. Step 5: Select User role(s) to control user access to the imported files. Step 6: Finally Click “Import Selected Files” button to import your files as packages. Hi – this is a very useful feature, but I’m having a couple of problems while attempting to set the link template and categories for several files using the .CSV option of Bulk Import. 1. Is there a list of valid values for the “template” column (column I) in the .CSV? I’ve tried different forms of the name of the template I want to set but none have been successful. 2. When I enter a list of comma-separated category names (which already exist as categories on my site), the package created by the upload is not given those categories. Is there something I’m missing on this field? I answered my own question #1… The list in Downloads>Templates shows the template IDs which go in that column. Still, can someone help me on #2? may you please post your issue #2 here https://www.wpdownloadmanager.com/support/forum/download-manager-pro/ , please attached the csv file you trying and temporary wp-admin login info in a private reply. how to add custom field values using the CSV option? When importing files through bulk import (either CSV or uploaded), are they set as individual packages, or as files that can then be added to packages? Planning a fairly large import, with packages that will contain multiple files, and am looking for the cleanest possible import option, without adding a lot of packages that are single-file when they should be multi-file. Do you guys know if there is a way to post through bulk import and include Yoast noindex and norobots follow command data? Yes, you can set value for yoost seo settings using Advanced CSV importer ( https://www.wpdownloadmanager.com/download/advanced-csv-importer/ ). To set noindex, nofollow add two new columns in your csv with following title yoast_wpseo_meta-robots-noindex and _yoast_wpseo_meta-robots-nofollow. Then set both values to 1 for each row. We will give this a try. Thanks for your input! Is there a way to separate each info in a column so it becomes easy when we add all files info we want to import? Actually, they need to be in the same row and each field is separated by a comma, that is how CSV files work :). I don’t see any folders in the directory tree, am I doing something wrong? Check your File Browser access settings ( root and roles ) from Downloads >> Settings >> Basic >> Access Settings Panel. Is there a way to make the “Assign Categories” list to display their hierarchy? I have many category branches and many sub-categories with the same name. Since it’s all flat and alphabetized, I can’t tell which child category belongs to which parent. Not yet, but we shall make it like a hierarchical list in the next update :). I am hoping to import 200 or so videos to records that already exist. Is there anyway I can do a bulk upload of these videos and attach them to already existing records? Example I have a record with name 2004-002 and a video named 2004-002-video. Also is there a way that I can alter just one field of already existing records? I have 860 records and I am hoping to update just one of the fields with the rest unaltered. The process is already explained in the doc above. #6. If you want to update any package, add an ID column in CSV file and use package ID there. Hi, Thanks for the reply. Once I import the videos using the methods you mentioned, how then will I associate those imported videos with my already existing records? You mentioned “If you want to update any package, add an ID column in CSV file and use package ID there”… could you elaborate on adding a id column in the csv file? Would the package id be the existing records name? Also when downloading the sample.csv file, do I need to add the custom fields that are apart of my records? You won’t have to attached the videos separately after import, they will be attached directly from your import file if you use the file paths in import file. I don’t see the sample CSV file mentioned. Where do I download it? Ok, so I figured out how to upload videos to already existing records. Is there anyway I can upload these videos and keep existing files already uploaded? For example, I have .pdfs uploaded to the records of which I am uploading videos to. With the current method those will be deleted when I upload the videos. Is there anyway to bulk import “featured images” on download manager? Yes, add “preview” column/field with full image path. Great. I will try those mentioned above. I thought I included this in a previous question but what’s the best way to get he post id numbers for all of the records or select group of records? I know how to get one individually but did know if there was a way to “export” or grab a larger portion of those at once. Thank you, Shafayet – you have been a tremendous help! Hi, I am unable to add “featured images” or thumbnails via csv to my site. I am using the ID and preview columns. The file path (FTP file path ex. /public_html/wp-content/uploads/2005-001-thumbnail.jpg) is in the preview column and it is still not working. Help? In CSV file while you are importing packages, you can add category names, if category doesn’t exists it will be created, otherwise ( the existing category ) just will be associated with the package. And multiple categories should be separated by comma within double quote, like "Category 1,Category 2,Another Category". What is the category column name.. Categories? I am unable to import category names through a csv upload. I have been trying using the “ID” column names and “category” column names. For my category row data, I have tried both upper and lower case with quotes and no quotes. No matter what combinations I have tried, I cannot get the category field to import. 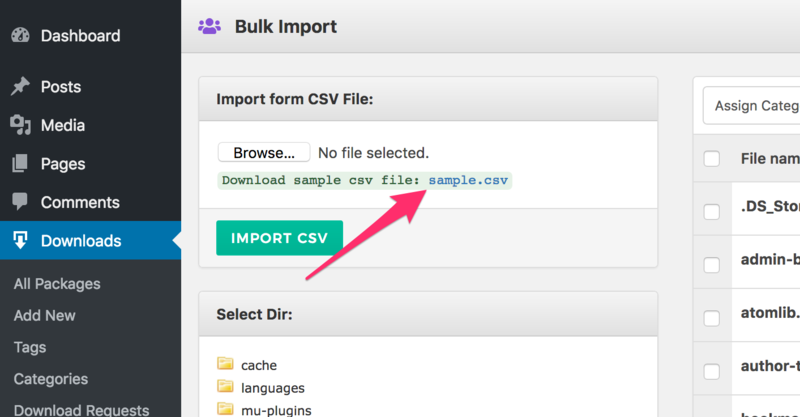 I have also tried both the bulk import through the download section as well as the “really simple csv” importer.